It’s time to rethink the way we think about China. 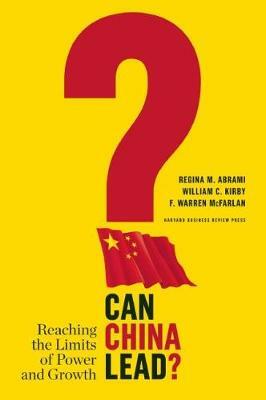 In this thought-provoking book, noted China experts from Harvard Business School and the Wharton School assert that while China has experienced remarkable economic growth in recent decades (nearly 10 percent for more than thirty years), it now faces major challengestests that could shift the country’s political and economic trajectory. A lack of accountability, transparency, and ease of operating in Chinacombined with growing evidence of high-level corruptionhas made domestic and foreign businesspeople increasingly wary of the China model.” These issues have deep roots in Chinese history and the country’s political system. Regina M. Abrami of the Wharton School and William C. Kirby and F. Warren McFarlan of Harvard Business School contend that the country’s dynamic private sector could be a source of sustainable growth, but it is constrained by political favoritism toward state-owned corporations. Disruptive innovation, research, and development are limited by concerns about intellectual property protection. Most significant of all is the question of China’s political future: does a system that has overseen dramatic transformations in recent years now have the capacity to transform itself? Based on a new and popular course taught by the authors at Harvard Business School, this book draws on more than thirty Harvard Business School case studies on Chinese and foreign companies doing business in the region, including Sealed Air, China Merchants Bank, China Mobile, Wanxiang Group, Microsoft, UFIDA, and others. Can China Lead? asserts that China is at an inflection point that cannot be ignored. An understanding of the forces that continue to shape its business landscape is crucial to establishingand maintaininga successful enterprise in China.